I ended my last post admiring the Japanese tools; but my admiration goes much farther, they have a big expertise, an innovative spirit without throwing their past overboard, blending in modernization with tradition. 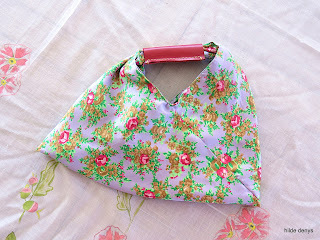 An example of this is the furoshiki bag! It is the most simple and sophisticated bag possible: you take a piece of cloth, you make a couple of nods and you have a bag to carry your stuff. Initially it was to take your belongings with you when going to the public bath, you know your towel, your soap, clean clothes I suppose or at least a clean set of underwear. You can't go bathing and returning home in your dirty clothes, can you? Then the use gradually extended to other stuff or other destinations. Wandering merchants must have used them too. Like the Roma people in Turkey used to do. Till about 20 years ago, Roma women went around with a huge cloth on their back in which they wrapped the niceties they were selling: embroidered towels, nice sheets, table clothes, things that weren't readily available in small towns or villages; I haven't seen them in a long time. You can also use them to carry books, to wrap a gift; hence there are different sizes of furoshiki. I am interested in bags and the usual formats are squares with a side of 45 cm, 95 cm or 105 cm. If I lived a 100 years ago and I went to the public bath, I would have used a furoshiki cloth matching my clothes or one contrasting my clothes. It is not surprising that there are shops selling only furoshikis. Anyway, I don't live in Japan, I don't know anybody going to Japan and I don't want to pay taxes when buying one online. 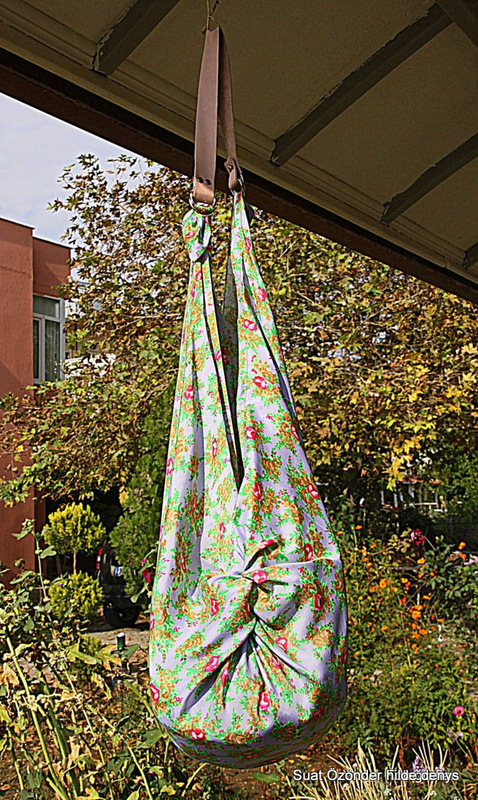 So to make my own furoshiki bag, I went through my stash of fabric; last year I went to an antique market in Ayvalik and saw a colorful silk-like cloth heedless dumped in a corner but with magnificent colors. I couldn't resist buying it despite its extreme slipperiness. Luckily I did buy it, because it is just perfect for my furoshiki bag. The fabric is a bit light and I could or should have lined it, but 1) I didn't find a matching fabric and 2) I couldn't wait to have my own bag. I just hemmed the square and started laying the knots; then, noblesse oblige! I had to have leather handles and with them my bag will look a lot more dressy. My first furoshiki bag with leather handle. I searched for leather with a matching color and a scrap long enough to make the handle; I had 4 D's left, stringed 2 of them at each end and closed the ends with rivets, really easy. Pink leather strap for my furoshiki bag. When searching for the handles, I found a piece of long black leather, perfect to make a long handle to use the bag cross-body. I had used my last D's for the pink leather handle and had no time to go to town to buy other ones and I decided to make the D's myself: I cut 3 square (I had a white square doing nothing) of 5 x 5 cm and emptied a square of 3 x 3 out of the middle and rounded the corners; then I cut a long strap, stringed the D's unto the strap and closed each end with a snap button. To make the handle more useful, I measured out how long the handle had to be to use it for a shoulder bag and put a third snap button in place. Now I have double use for the handle. Just imagine a nice fabric going well with black, maybe red or cognac brown; 1 strap, 1 piece of cloth, at least 2 different bags! For my bag, I used a square with a side of 105 cm and it is a big bag; in the picture it holds a light cotton cardigan and a woolen (knitted with my own hands) cardigan. My new bag will look super with denims, black jeans and 'll look right going to town, casual style or to the beach, very "user friendly". 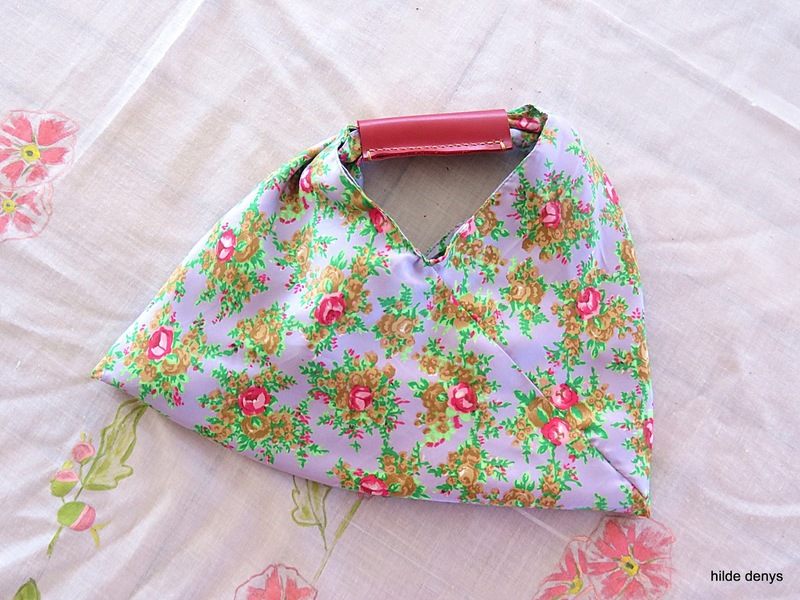 The Japanese have also a popular triangle bag, origami style: one piece of cloth, the length being 3 times the width, you fold it one corner up and one corner down and then diagonally in two, stitch two seams after hemming all around, knot the two ends together and there is your bag; or you make 2 of them, one as lining and one as the outside and sew them together. 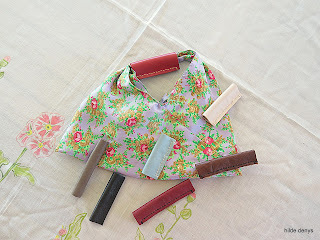 Here is a tuto with pictures and text: http://pm-betweenthelines.blogspot.com.tr/2013/02/triangular-bag-tutorial.html if you want to make one for yourself and I can get you a leather handle to make it a bit more stylish. I love the fabric I used for my furoshiki bag so much that I used the same fabric for my origami bag. 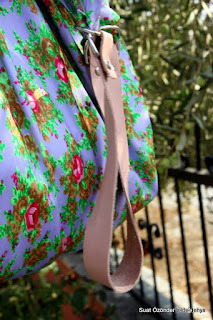 It is a quite simple but a very rewarding bag and so versatile. 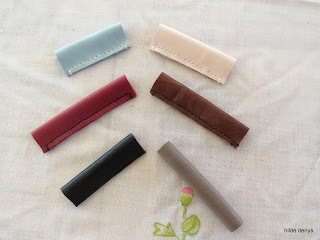 And instead of knotting the ends, I slipped a tubular shaped piece of leather over 1 end, sewed the 2 ends together with a couple of stitches, slit the handle in place, covering the 2 ends and then govgo, stuffed with your wallet, cell phone, comb, little make-up bag, whatever you need. 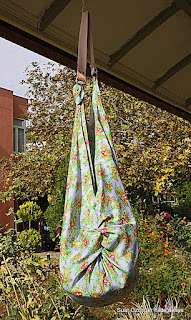 I had 2 pieces of fabric left, 60x 20 cm and used them for my bag; but the standard size is 75x 25 cm, which is a better size. I had some colorful small scraps of leather, just big enough to make some handles; the first one I made I glued the ends together, but the hand stitched ones look a lot better! See for yourself. my origami bag with red leather handle. Origami bag with LoveLea's leather handles in different colors. The olives are almost ripe; this year our 6 year old trees are doing very well. We have 4 of them in front of the house. We prefer our olives black but since the trees did so well, we decided to pick some of them green; this way we will have less work when they are turning black and the remaining olives will grow bigger. We picked about 2 baskets of the biggest ones, washed the dust away and put them in a large basin with water. We'll change the water every day, for about 1 week and when their bitterness is gone we'll cure them with some salt and slices of lemon. Yummy yummy; most people crush them but they get mushy and soft easily, fall apart after 2 months, thus we leave them whole. This year the trees have made a lot of little bunches; I was afraid of worms and rot because last year the mandarins came in large bunches and where they touched each other, they were rotten. When I saw this bunches when small, I was afraid the olives would rot, but nothing of the sort happened. Swimming in October: today the weather was sunny and no wind, perfect for a little swim. I love snorkeling and I was witness of a special thing. I came to an area with a lot of different fish, followed 2 seabass around and then saw the kind of fish that cleans the bottom of the sea (I don't know their name); they have vertical stripes and before my eyes, one of the fishes, about 10 à 12 cm big, spit out or threw up a half of an empty shell, a delicate, triangular shell about 2 cm long en 0.5 cm high, followed by some pieces of dried seaweed! This just made my day! But I didn't get my post ready in time, sorry! 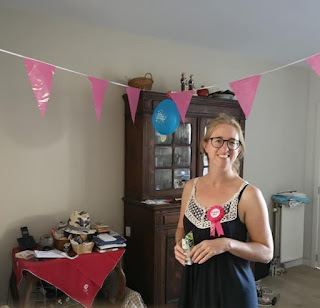 P. S.: if you feel like writing something in English, Dutch, French or Turkish, please go ahead; I would love to hear from you and have some interaction; at the bottom of the post, just below the date, you can leave your comment.